Ummm…..Are there two better words that can be smashed together to create awesomeness. I think not. I have to admit that I am a little late to discovering the magical product known as Biscoff. But from the moment I discovered how insanely and ridiculously good this stuff is, I instantly began plotting on how to put on everything I eat. I’ve smeared it on fruit, I’ve put in in a bar, I’ve put into a cookie , I’ve even put it on popcorn. If you’re reading this and starting think that maybe I’m a bit obsessed, you may actually have a point. But I prefer to think of it as knowing a good thing when you see, or in this case taste it. So why wouldn’t I put it in a cheesecake, right! Cheesecake is one of my favorite desserts. It’s rich and creamy and decadent. As much as I love it it’s definitely not something I can eat every day. Whenever I have a slice of cheesecake I always feel like it’s a special occasion or like I’m treating myself. I wouldn’t want to ruin the magic by just gorging on it. There are many tips ive picked over the years about getting the “perfect cheesecake”. The two best being using a water bath and cooking on a low temperature. Using those two tips should get you that pretty cheesecake with NO CRACKS. 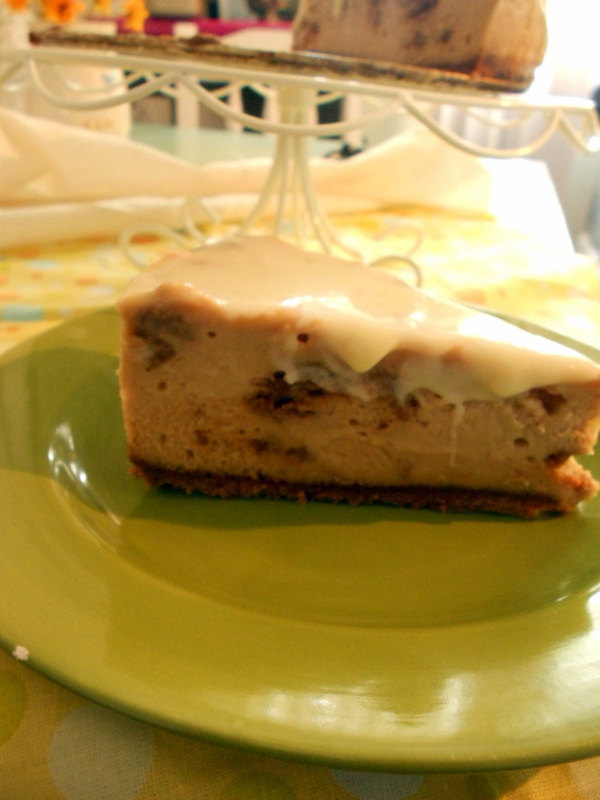 Now let’s add the Biscoff to the cheesecake ….talk about insane. I have to say the minute I tasted the spread I just knew I had to add it to cheesecake batter. I just pictured the creamy smooth texture of cheesecake with the Biscoff flavor. So if I was gonna go Biscoff in the cheesecake I was gonna go all in, Biscoff cookie crust, Biscoff spread and biscoff cookie chunks in the batter. And just to add another level of ridiculousness I poured a white chocolate glaze on top. I really wish I could have gotten some more fabulous shots but to be honest half of it was gone before I even pulled my camera out. Although I used Biscoff spread in this recipe …..you can really use any brand of cookie butter or spread you want store bought or even homemade. Preheat oven to 350 degrees. Cover the outside of 9-inch springform pan with heavy duty aluminum foil. In a medium bowl combine the cookie crumbs, sugar, salt and melted butter. Mix well ( I like to use a fork, or my hands). Press into the bottom of the pan. Place in preheated oven and bake for 10 minutes. Remove from the oven and allow to cool. Lower oven temperature to 300 degrees. In bowl of an electric mixer beat the cream cheese and the sugar together until smooth. Beat in the Biscoff spread and the heavy cream until fully incorporated, stopping to scrape the bowl if necessary. Add the flour and vanilla. Reduce the speed to low and add the eggs one at a time, making sure each egg is completely mixed in. Remove the bowl from the mixer and with a rubber spatula fold in the cookie chunks ( you can use the mixer but I just like a light touch with this part so you can keep some of those big cookie chunks). Pour Batter over crust. Place the Cheesecake pan into a larger pan such as a roasting pan. Pour *HOT tap water into the roasting pan. The hot water should be surrounding the cheesecake pan by 1 inch. Making sure to be extremely careful place the roasting pan in the preheated oven and bake for 1 hour. After one hour turn the oven off and allow the cheesecake to sit in oven for additional 30 minutes. Allow cheesecake to cool to room temperature before placing in the refrigerator to chill overnight. For the glaze: follow the recipe and pour over chilled cheesecake and allow to chill for additional hour.